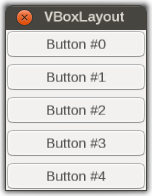 Screen shot showing a simple Canvas GUI dialog with a handful of Button Widgets arranged with a vertical/vbox layout. First of all, we're going to add a new menu item to open our new dialog. This involves adding a new translation entry, as well as the actual menubar entry itself. For a more sophisticated example, refer to Howto:Reset/re-init Troubleshooting. See Howto:Creating a Canvas GUI Widget for the main article about this subject. In order to keep your dialog sufficiently generic, you'll want to refrain from adding too much custom functionality to it, and instead decompose your functionality into a collection of widgets. Widgets are GUI controls like a label, button, checkbox etc that support styling - i.e. these widgets have a certain appearance and may respond to events such as being clicked for example. Whenever you create custom widgets instead of adding all the code to a single dialog, you'll end up with reusable components that can be easily other in other dialogs. In addition, you are making sure to establish a losely-coupled design, so that your widgets are sufficient generic and do not contain any use-case specific logic (think widgets being too specific to the dialog they were originally implemented for). This means for example that a generic PropertyBrowser widget could be easily reused in other dialogs/windows requiring a corresponding property browser. But this also meanns that such a property browser widget should also be modularized, i.e. by using a lower-level ListView or TreeView widget and merely parameterizing that by showing properties. This approach has the added advantage that the corresponding ListView/TreeView widgets could be re-used in other places, such as for example an aircraft list, a Nasal Namespace Browser. Likewise, a widget-focused approach means that useful functionality like an Interactive Nasal REPL can be easily used in other places, without developers having to do any refactoring. We're also trying to make sure that Canvas Widgets can be easily used not just by GUI dialogs but also by Canvas-based instruments/MFDs - without any code duplication or Copy&Paste being required. Sometimes you may have the need to present a GUI dialog for dealing with a MFD, potentially even showing the MFD screen itself in the GUI dialog. With Canvas, this can be accomplished by creating a dialog procedurally and adding a placement for the MFD (Canvas) that is to be shown, or even by showing an indepenent instance for your MFD (FGCanvas). This page was last modified on 3 October 2017, at 06:39.